Digital Branding is the tactical implementation of positioning your brand to gain maximum awareness, interest, and action from your consumers. EverythingOnline helps brands dominate key real estate to gain new consumers and nurture existing consumers. What we ultimately want to do is to position your website as a trusted and authoritative resource; to direct traffic to that site, then use it to convert that traffic into paying business. We draw on our peerless SEO and content marketing experience for this, yet we also tailor our services to meet the needs and goals of your brand. Again, what we’re interested in is getting results, plain and simple. That’s the approach that sets EverythingOnline apart. Marketing your business is all about improving the bottom line—selecting the most cost-effective, results-getting marketing tools possible. That almost always means paid media, but it’s equally important to consider an investment in earned media. Earned media is the Web traffic your company gets through producing SEO-enriched, value-adding content; when done right, an earned media approach can not only generate leads, but also establish the thought leadership of your brand, building a rapport of trust with potential consumers. Of course, not every approach to earned media gets results, which is what makes it important to work with a trustworthy partner—and that’s where EverythingOnline comes into play. We’ve amassed decades of experience in digital advertising as well as corporate sales. We know what works, what doesn’t, and how to tell which approach will get the best results for your business. We want to be your go-to digital marketing partner, and our pledge is to only recommend approaches that help your bottom line—and that includes everything we do in the realm of earned media. We have developed some of the most advanced and responsive tracking systems in existence, which means we always have a good sense of what’s working and what’s not in your earned media campaign; we can also verify ROI at every step of the way. 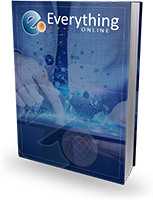 With EverythingOnline, you never have to wonder if your marketing dollars are making any kind of an impact. The data is always right there for you to consider. Beyond that, we’re a seasoned marketing team, made up of expert-level talents. We’re able to adapt our services to provide any service you need—to become your content creators, your outsourced SEO division, your CMO, or whatever else. We are committed to only doing things that get results for your company. We know that you’re not interested in fluff, or in wasted ad dollars. You want to hit both long-term and short-term business goals through your earned media strategy, and that’s what we deliver.